So, the answer to the contest question was 533 (148 primary, 385 secondary). Anyone who thought it was over 1000 scared me, though I think my clues might have misled guessers to the bigger numbers. This means the winner is Juicelbee who guessed 539. This was a very economical project. I picked up six balls of the yellow in the summer sales. I was sure I could get a tee out of just six, but also knew it'd be tight, which meant working a size down from what I would normally and a lot of 'will I make it' nail-biting. 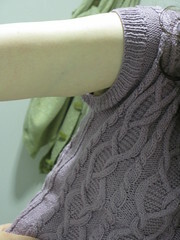 It is also a winner of a knit. A very wearable garment and if anything the smaller size was a good choice - I wouldn't want it baggy. 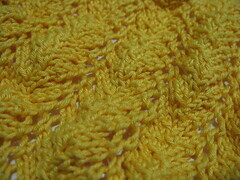 Its a genius pattern - easy and elegant, I can see why its so popular. 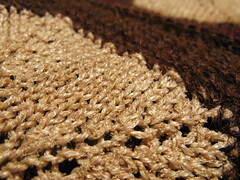 More details on the project's ravelry page. 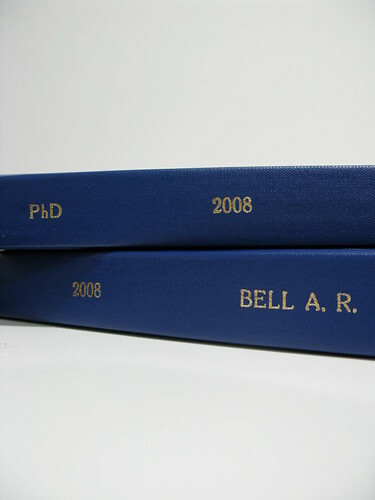 Firstly, thanks for all the congratulations about handing in my thesis. If you still want to enter the competition there is another day to get your guess in, have a second guess if you want - only two though (note: I've extended the deadline by a day). 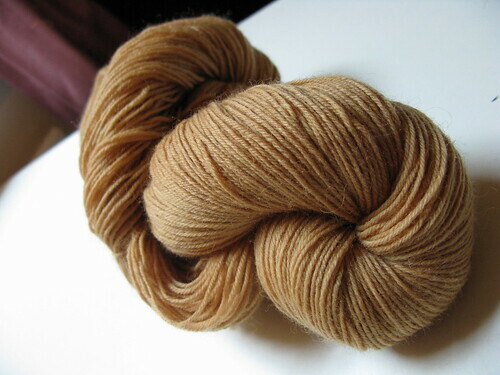 If you want to see it knitted up, here's a shot of a skein I dyed at the same time. 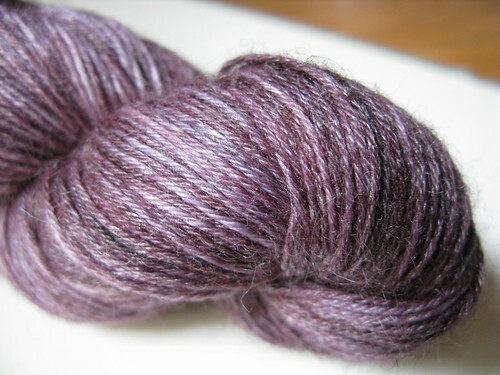 A few people asked about the dying process, I'm writing it up on the yarn's ravelry page. 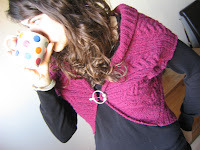 More good news: the Interweave preview is up for fall and one of my designs is in it. To celebrate, I brewed up a good old pot of tea. Except, I stuck a load of yarn in it rather than actually drinking the stuff. I'd read about people dying with tea before, and, still reeling from the smell of koolaid (people drink it? ), I thought I'd give it a go. I got a bit carried away and dyed about half my stash, its amazing to see how the different yarns took the tea differently (its all the same brand of tea-bag). Above is some more bamboo/wool sock yarn, which I think will end up as a baby garment. Below are before and after shots of Orangina I made with some cotton bought in the summer sales. The original colour was a bit too bright yellow. Dunking the FO in a saucepan of tea before I blocked it has just muted it a bit and brought out the golds. Only a slight change, but a much more wearable garment. 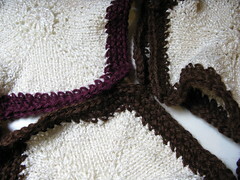 Some more before and after shots, this time from a shawl of knit/crochet hexagons. Again, the original (this time a bright white) was a bit too strong and the tea calmed things down, but it came out much more bronze than the other two. And finally, because you can't have afternoon-tea without some bread and jam, another comparison shot from a taste-test I did today. 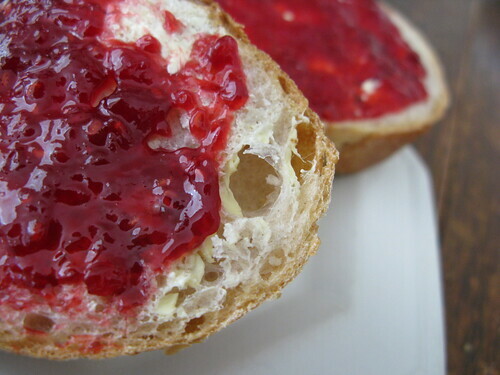 The front bit of bread has some raspberry jam I made back in April. The one behind is from a batch I did on tuesday, to a recipe from the Guardian. This new batch uses a lot less sugar, and consequentially, to my taste, is a lot yummier - its much more fruity. Still, I'm sure it won't keep nearly so long. NB: This just means I've finished the first big bit. It still has to be examined. I'm now on holiday (though at home, and online) for a week. Much of which I plan to spend knitting in the park, weather allowing. I've always wanted to take a photo of something I've knitted from the wearer's point of view, but I've never had a good enough camera before. You will have to excuse these 'in the mirror' shots - no time for a proper photoshoot. Needles: 3.0 mm & 2.5 mm addi circs. 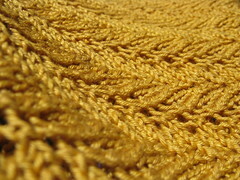 Yarn: 6.5 skeins of Rowan RYC Cashsoft 4 Ply in 'monet'. The first skein was a christmas present from my brother, I just added a few more to make it into a whole garment - thanks for the inspiration Jim! Mods: I worked in the round till v-neck divide, then seporate pieces flat. I contemplated steeking, but was too much of a wimp. Only two little seams for the shoulders, which if I'd been thinking I could have kitchenered. As usual, I did the entire thing without the aid of a cable needle. I also sketched out a chart as, it being a Debbie Bliss pattern there wasn't one and I prefer things pictorially. 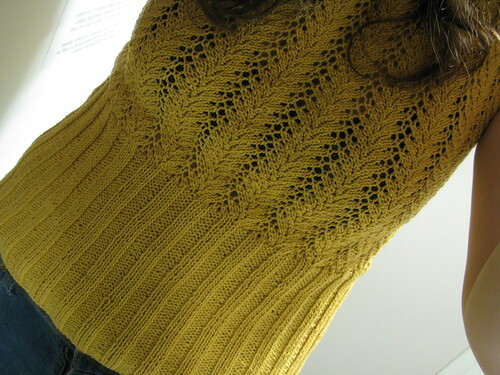 The project actually started out as the chevron lace top from Romantic Style (wip shot here). 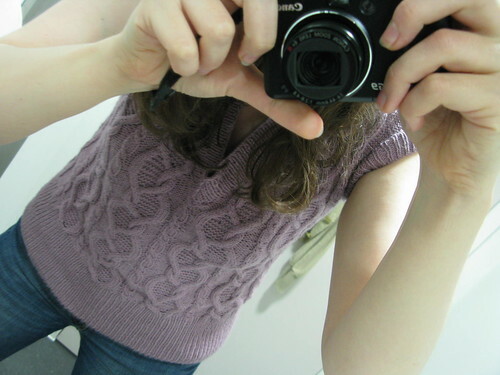 I also adapted that to work in the round, but just after I divided for the arms I decided it wasn't nearly as nice as it looked in the pattern photos (especially the non-lace bits under the armpits), so frogged it down to the ribbing. I'm very pleased with it, the sleeves are way more flattering than I thought they'd be - I might work up a design using similar sleeves if I have time this summer. 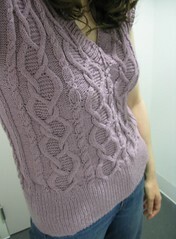 And in non-knitting life, here's a very nearly done work-in-progress and a very exciting 'finished object'. 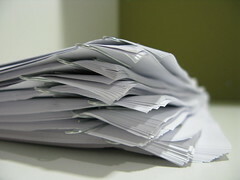 The wip is a print-out of my thesis. 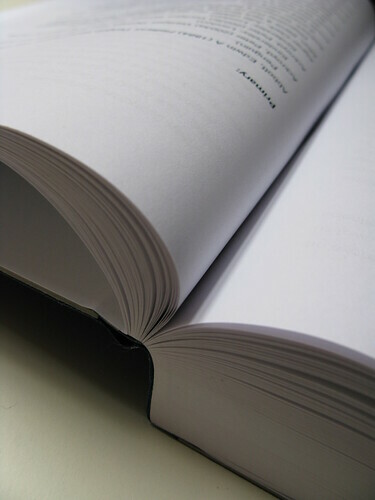 My 2nd-supervisor wanted a paper copy to read from, and because I'd just been treating it electronically, only occasionally printing a chapter at a time, I'd not really had an idea of its size before. Thank goodness I inherited a box of my Dad's giant paperclips (he orchestrated film scores, he needed good paperclips). 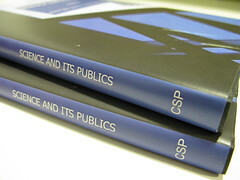 The FO is a book of academic essays I co-edited. Today is 'polishing off conclusion day'. Then I'm emailing the thesis to my mum for a proof-read and running off to Oxford for the weekend for a History of Science conference.